Naturally you’ll want to take care of your caravan and protect it from risks like theft. In addition, most insurers will require some form of security device to be fitted to your caravan before they agree to cover it. So what’s what in the world of caravan security? We’ll run through the main security devices available to protect touring caravans and explain when you’re most likely to need them. Hitch locks are often required by an insurer as a minimum security requirement. It’s a metal box designed to fit over the coupling head while the caravan is stationary. Once locked, the box pushes a ball into the coupling head so it is lodged in a way which makes it virtually impossible to hitch onto the tow bar. This is handy when your pitch up your caravan on a park and go out for the day or when you stop at service stations. There are a variety available so do check which is best for your caravan. Wheel clamps are another device that are usually required as a minimum security measure when you’re insuring your touring caravan. They come in many shapes and sizes but they all essentially do the same thing. Wheel clamps encase the wheel and prevent them from rotating. You simply tighten the clamp over the wheel using bolts then attach casing to enclose the bolts with a second set of casing so they are inaccessible. Like with hitch locks, you should check the wheel is suitable for your caravan. Some are not suitable for alloy wheels but a quick Google search should help you establish if you’re looking at the right device. An anchoring device literally anchors into the ground and embeds itself there making it very difficult for the caravan to be towed away. You might find these at some parks and storage locations as an extra security measure and they are often used to keep private parking spaces private. Hitch posts are concreted into the ground and can be lifted once your caravan is in parked up so the caravan is blocked in. If you store your caravan on your driveway at home this is a good measure to take both as a visual deterrent and a physical barrier. These are quite different to wheel clamps. 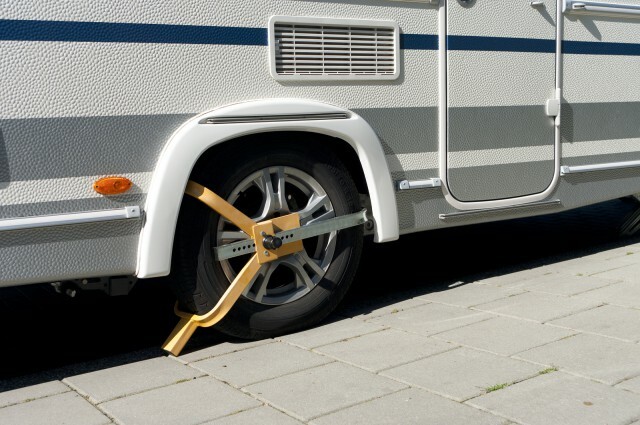 Rather than encasing the wheel to restrict movement, a wheel lock goes through the wheel and locks onto the chassis of the caravan. For higher value caravans, you may find insurers requesting more security and a wheel lock can be a good solution. Just make sure you check which wheel locks are accepted by your insurer. This method may seem like it only helps if your caravan has already been stolen but in fact thieves who spot a sticker or logo for a pro-active tracker will probably think twice before attempting to take your caravan. A unit will be hidden inside the caravan and track the caravans whereabouts using GPS. Some models will even text you if your caravan has moved so you can alert the police straight away. Most companies who provide pro-active tracking devices will also come out and fit them for you too. For more information on touring caravan insurance or to obtain your quotation from us, please contact one of the members of our caravan team at A-Plan Bromsgrove on 01527 879777.